It’s been a while since I’ve seen Wilco; heck it’s been a while since I’ve seen a headlining show at all. I was doubly excited to see one of my favorite bands from the Midwest, showcasing some old and loads of new songs live at the Fillmore Auditorium. Jeff Tweedy and the gang kicked off their North American tour in Denver and did not disappoint. They came onstage to a set up of tied-up sheets (as if there were a bunch of white-sheeted ghosts hovering about) with lights flickering inside them, vividly reminding the audience how haunting but warm Wilco can be. Every time I see them (and for me this is the ninth time), I get butterflies thinking how they will perform those songs off their new album live. I thought that with Sky Blue Sky and, of course, Yankee Hotel Foxtrot, and again, Thursday night, sure enough, right before they came on I conversed with a good friend of mine about what it was going to take to recreate those maniacal sounds in a live setting showcasing songs from The Whole Love. They performed without a hitch, and I was blessed to see that their North American tour will definitely not disappoint. Even if you’re on the fence with Wilco, you might as well fork over the generous amounts of money to see them on this tour. You will greatly appreciate it. Their set started off with the emotive “Poor Places” from YHF, then hypnotized the audience with mind-melting guitar riffs of Nels Cline on “Art of Almost.” This paved the way for Wilco to showcase six new songs off of The Whole Love, with brief stops along the way with old favorites “Misunderstood” and “I Am Trying To Break Your Heart.” This show was (if I may steal a term from my former years of living in Thailand) “Same Same, But Different”: they had the big guitars, they had the old faithful fans, but the crowd was definitely younger and the songs played were more mature, yet playful and gripping, which held the attention of new and old fans alike. For a full set list go here. 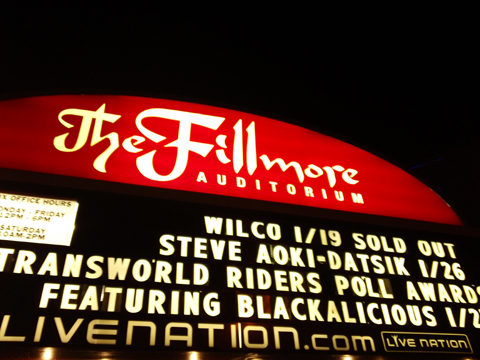 Wilco lived up to their persona, and Denver was honored to be able to kick off their North American tour at the famed Fillmore Auditorium. Jeff even commented on how fun it was to play in a place with purple chandeliers. I couldn’t agree more. 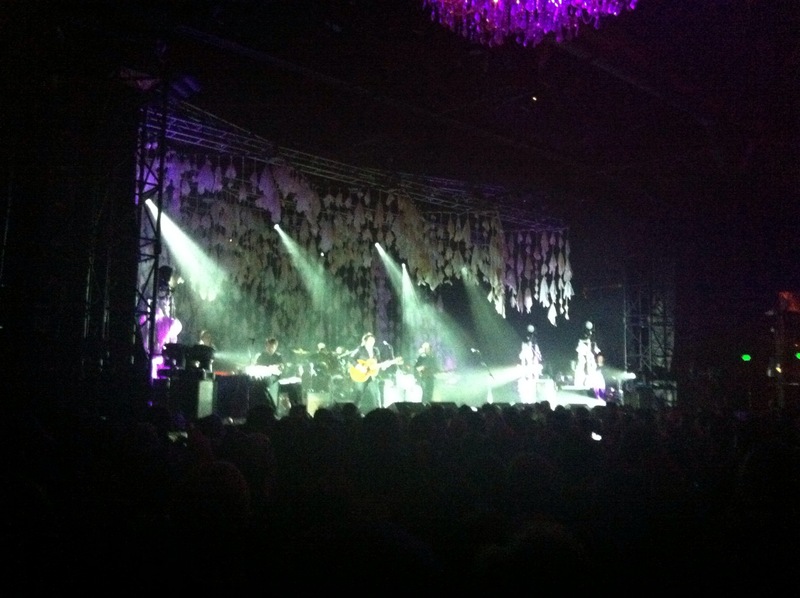 Wilco is a great live band that suits a more intimate setting. Although Red Rocks is just a few short miles away, it was still nice to see them up close and personal. Check to see if they’re playing any tour dates near you, I promise you will stomp your foot,and smile at Jeff’s banter as they take you on the tumultuous journey that signifies Rock and Roll in the purest sense of that term.